because I don’t want to upset them! 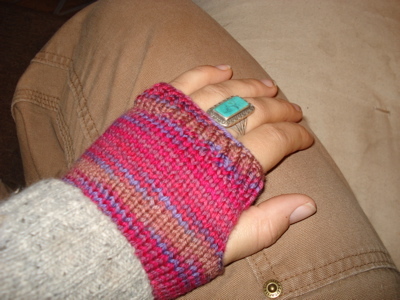 The fingerless mitts turned out very nicely. I decided to end the second one a few rows early in order to use only one of my 2 skeins of this Artyarns Supermerino, but I estimated the gauge correctly and they fit very well. I bet I could get away with even fewer stitches just to eliminate the worry of running out of yarn. 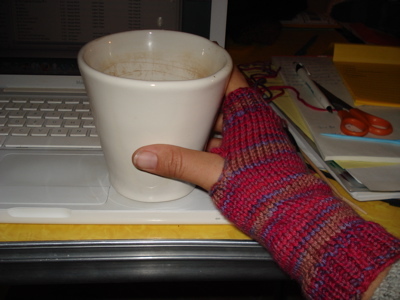 I will most certainly use these guidelines again — I love these mitts, particularly the way they show off the yarn. I am planning to put them to good use today — the dog and some friends and I are off to play outside for the day. Coffee? Check. Thermos of tea for later? check. Bone for the dog in the car? Check. Warm clothes? Check. Camera? Check plus.